*By all accounts, Sean “Diddy” Combs is a super successful person, but even though he attended college (Howard University), he didn’t get his degree. However, he made sure his son, Justin Dior Combs, did. On Thursday, the Combs beamed with excitement and pride as he sat alongside Justin’s mother, Misa Hylton, and snapped a pic while anxiously awaiting his oldest child’s walk across the stage to receive his Bachelors degree in Sociology. Justin also played for the UCLA Bruins as a defensive back. 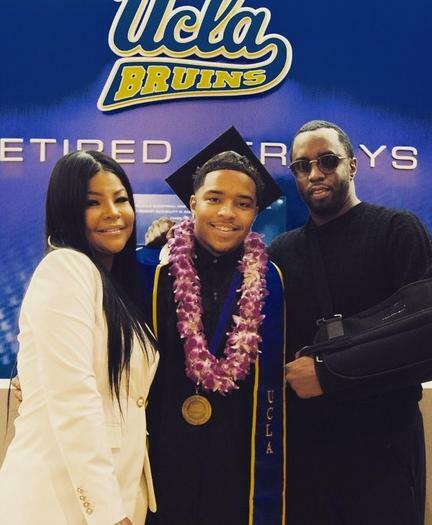 Describing the moment as “one of the greatest days” of his life, Diddy was also proud to reveal that Justin is the first in the Combs family to graduate college via an Instagram post. The proud parents!!! @iamdiddy With @fonzbentley in the cut ? #uclagraduate2016 @princejdc we are so proud of you and love you so much!!!!!! Combs also gave props Misa for “doing such a wonderful job” in raising their son in a separate social media post, a sentiment echoed by Justin himself when he gave a touching speech before a crowd of family and friends at his graduation party shortly following the ceremony. As we said up top, Diddy didn’t get his college degree after attending Howard for two years after high school, but he was later awarded an honorary doctorate degree by the prestigious HBCU in 2014. Justin’s siblings, aunts, uncles and grandparents were also on hand to help celebrate his special day.